activity and targeted sting operations with the NYPD. driver’s legal and exclusive right to pick up street hails. Until now, we have had little choice. of service that we hope will make a major dent in illegal street hail activity. TLC and we are demanding action. success at hearing. We have already discussed our initiative with the TLC and we are ready to launch. to distribute to drivers and that the MTBOT Driver Resource Center will distribute to drivers. TLC and following up on our progress. We believe that we will be successful in raising awareness of the illegal street hail epidemic and get action. issues, public safety and other concerns that impact real people and real communities. handle the rest. Together, with all hands on deck we can make the difference. 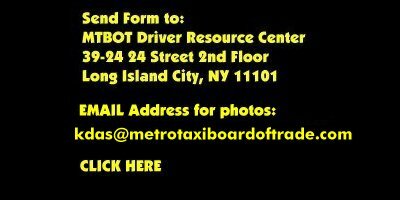 We are going to have the information sheet printed on stock paper cards for the drivers to use. We would prefer those to be returned to us (or the garage) or mailed in. The email is designed primarily for photos and documents.